Hizb ut-Tahrir in the Wilayah of Pakistan held demonstrations across Pakistan against the visit of US Sectary of State, John Kerry. 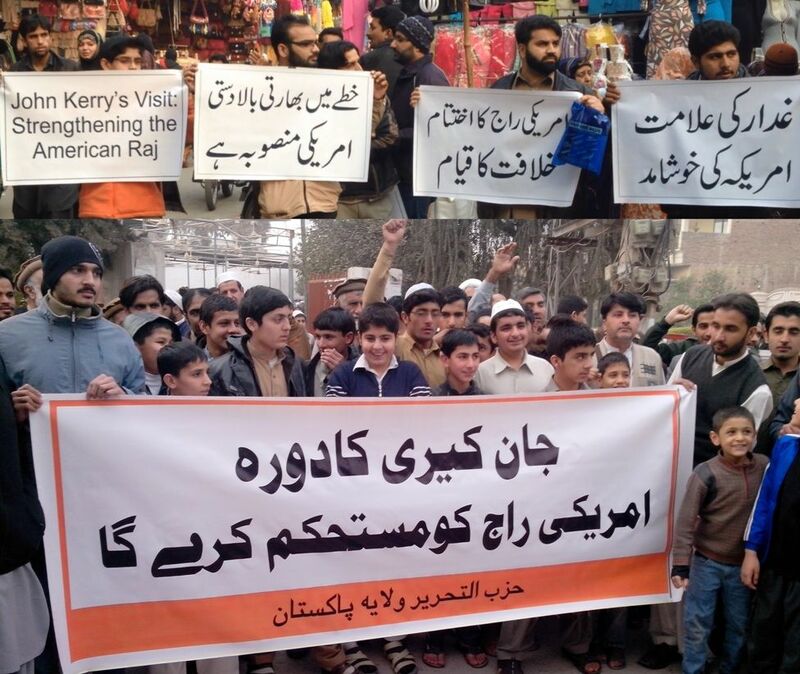 Participants held placards declaring “John Kerry’s Visit: Strengthening the American Raj” and “End the American Raj, Establish Khilafah”. Protesters maintained that John Kerry’s visit of Pakistan and strategic dialogue will strengthen the American Raj in Pakistan. America is the enemy of Pakistan and only traitors can have friendship with an enemy. In order to establish that America is the enemy of Pakistan, it is quite enough to know that Pakistan always incurs losses politically, economically and militarily as soon American political, economical and military presence increases in Pakistan. According to economic survey of Pakistan, in the last thirteen years Pakistan’s economy suffered a loss of almost 100 billion dollars after joining its war in this region, on top of the loss of thousands of lives. Protestors maintained that the claim of traitors in the political and military leadership that Pakistan can’t survive without political and economic assistance of America is totally false and baseless. Rather, it is American aid which does not allow Pakistan to stand on its own feet and if the ruling and economic system of Islam, which is Khilafah, is implemented in Pakistan then there will be no need for foreign assistance. Protestors demanded from the sincere officers of the armed forces that they must eradicate the American presence from Pakistan in accordance with the commands of Allah (swt), close its embassy and consulates, expel US diplomats and intelligence personal and quash C.I.A and Black Water operatives. They also demanded that they must extend support to Hizb ut-Tahrir to establish Khilafah to achieve these objectives. Then Khilafah will cut the head of US snake and cleanse Pakistan from American filth.